“THE GIFT FOR LEAVING THE 12:60 RATIO AND ENTERING THE 13:260 RATIO IS THE THIRTEEN MOON CALENDAR FOR CASTING THE PLANETARY SERVICE WAVESPELL. KEYED TO THE DREAMSPELL JOURNEY BOARD, THE THIRTEEN MONTH WAVESPELL UNLOCKS ALL CASTLE WAVESPELLS AND OPENS THE TWO HUNDRED SIXTY GALACTIC GATEWAYS OF TIMESHIP EARTH. Welcome to the fourth-dimension! You’ve been here all the time, but just haven’t known about it! Your ideas of time have been programmed by the clock and the 12-month calendar. The clock is actually third-dimensional measurements of space applied to the idea of time; while the 12-month Gregorian calendar is an illogical and inaccurate effort of keeping a count of days. If the nature of space is interlocking sets and levels of atomic and molecular structures, the nature of time consists of interlocking levels and sets of holon simultaneities. Just as the atom is the primal model and unit of space, so the holon is the primal model and unit of time. Space is the third-dimension, time is the fourth. The base holon unit is the ‘perfect fifth:’ a tetrahedron (four-sided pyramid) and its invisible center point, the g-force core. G-force is the ‘mysterious’ fifth force; its core is always in the now. The holon-tetrahedron forms the underlying structure of the 13-tone wavespell. 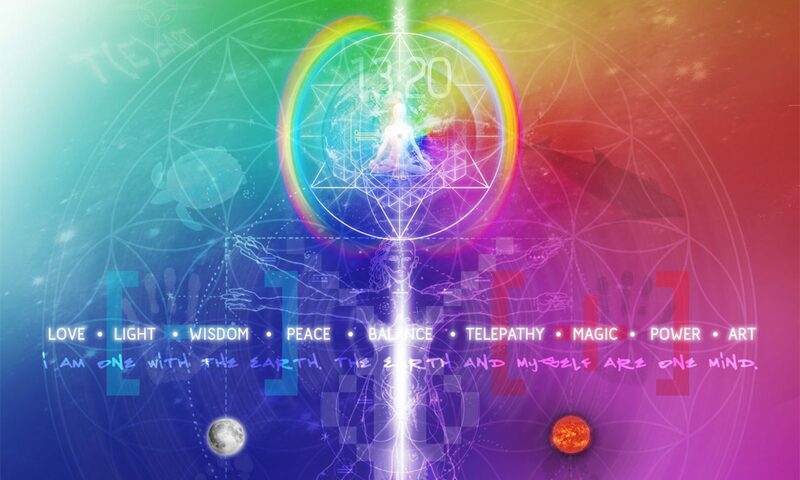 The 13-tone wavespell is the living cosmology of the fourth-dimension. The four visible points of the holon-tetrahedron create the two gates and two towers of the wavespell: the magnetic gate (tone 1), the overtone tower (tone 5), the solar tower (tone 9), and the cosmic gate (tone 13). The nine remaining tonal positions create the nine ‘chambers of the wavespell. The wavespell is the fourth- dimensional ‘standard of measure.’ The wavespell may be expanded or decreased according to the law of kin equivalents. A kin is the fourth-dimensional ‘unit of measure.’ In the wavespell each of the 13 tones is accorded the equivalent of one kin. The wavespell can accommodate the count of 13 days, where one kin is one year, and so on. The 13-moon calendar is also a wavespell, where one kin equals a moon of 28 days. Each 28-day moon is a perfect set of four seven day weeks. Each set of four weeks of the 13- moon calendar is an ‘augmented harmonic.’ The harmonic is a four-kin unit, the smallest aggregate unit of the 260-kin galactic spin. The purpose of the 13-moon calendar is to synchronize the solar-lunar year of 365 days – 13 moons of 28 days each, 52 weeks of seven days each, plus green day [Day-Out-of- Time] – with the galactic spin of 260 kin (days). The 260 kin galactic spin is the ceaselessly spiraling vortex of time that synchronizes with the 13-moon calendar precisely every 52 years. Each galactic spin consists of 20 13-kin (day) wavespells. These wavespells are arranged in five sets of four. Each set of four wavespells is color-coded: red, white, blue, and yellow. The 13-moon calendar is programmed so that the color-coded 13-day wavespells appear in unending sequence as an overlay on the four seven-day weeks of each moon. By following the 13-moon calendar for eight years – AD 1992-2000 – you can make the transition from the current third-dimensional model of time, seven-day week, to the galactic model of time, 13-kin wavespell. The 13-Moon calendar is a special application of the 13-tone wavespell cosmology. The wavespell is the form-in-time of universal life. Universal life means that everything is alive. Since everything takes its form in time, time is life, time is biology, galactic biology, cosmic biology. The wavespell is actually a fourth-dimensional form of life, and may assume the qualities of a living being. As a living being, the wavespell of the 13-moon calendar is a planetary vehicle of liberation and enlightenment. The 13-moon calendar is a vehicle which has the power of automatically and simultaneously entering every human on the planet into the new time of galactic culture on Earth. The new time of the thirteen moons is the new path of life for creating equality and non- aggression on planet Earth. Once entered into, the new time of the 13-moon calendar synchronizes all humans with themselves and with the planet. Confusion will be eliminated, and forgiveness and liberation may be instantly granted. This liberation is the liberation from fear and ignorance. Why and how? The 13-moon calendar places everyone in the correct time: now. The 13-moon calendar is without a history. It does not drag a past forward but brings the galactic order into focus, in the now. Now is without a history. The correct time is now, and the only enlightenment is now. Any now can be as simple as a breath of air, or as complex and overlaid as a profound meditative reflection. Now-centered and without a history, the wavespell of the 13-moon calendar is a vehicle of salvation for all of humanity and the planet. The 13-moon calendar is a skillful means provided by the Galactic Federation to enable every human to experience her or his own enlightenment. By following the 13-moon calendar, the human enters the perfect form of the annual planetary wavespell. The wavespell is the living galactic unit of time. It is the cosmobiological indicator of higher dimensional existence. It is the way lower dimensional existence evolves and awakens into its galactically enlightened form. As an annual planetary wavespell, the 13-moon calendar describes the galactically attuned enlightenment body of planet Earth. This is why it is a complete vehicle and path of liberation from the confusion and torment of not knowing in the now – which is enlightenment. As a description of the enlightenment body of the Earth-in-time, the calendar of the 13-moon wavespell can bring all humans into enlightenment in the course of eight solar-lunar years. To enter the thirteen moon path is to enter a new world of time, a world of wavespells, pulsars and overtone pulsars, of harmonics, chromatics and galactic spins. The 13-moon calendar is the day-by-day approach to learning and living the different holon simultaneities of the fourth-dimension. By following the path of the calendar of the thirteen moons every human has the opportunity of becoming a planetary kin. A planetary kin is a galactic enzyme passing through the wavespell-body of Earth-in-time. Because the 13-moon calendar is perfectly attuned to and coded by the 260-kin galactic spin, by following the path of the thirteen moons, any human is also imprinted by the 260 kin of the galactic spin. These 260 kin are the galactic enzyme codes of interdimensional existence. Understanding the interdimensional nature of existence, a planetary kin, free and equal with all other planetary kin, furthers the forces of galactic evolution and universal enlightenment. Correct understanding of the fourth-dimension enables the planetary kin to understand the ignorance of deathfear, the chief failure of third-dimensional will. Overcoming deathfear, the planetary kin can dissolve the mental paralysis caused by belief in technology as a solution, and release from civilization understood as material infrastructure to be maintained at all costs. The only intelligent choice remaining to a planetary kin is the pursuit of universal life: telepathy and higher collective bonding with all of existence. This transformative process is rendered natural and ordinary by the planetary service wavespell, the easy way of learning how to walk the path of the 13-moon calendar and to gain full entry into the fourth-dimension. The thirteen tones of the 13-moon wavespell accommodate every expression of the holon in its moving pulsar and overtone pulsar forms. From the interaction of the different pulsars and overtone pulsars, the planetary service wavespell may be projected and constructed. The planetary service wavespell is the way planetary kin can synchronize their goals and action in annual increments on behalf of the betterment of themselves and the Earth. The Four Pulsars according to the 13-Moon Wavespell. 1. Fourth-dimensional Time Pulsar: Magnetic Moon One; Overtone Moon Five; Solar Moon Nine; and Cosmic Moon Thirteen. Identify and fulfill purpose. 2. First-Dimension Life Pulsar: Lunar Moon Two; Rhythmic Moon Six; Planetary Moon Ten. Identify and fulfill challenge. 3. Second-Dimension Sense Pulsar: Electric Moon Three; Resonant Moon Seven; Spectral Moon Eleven. Identify and fulfill service. 4. Third-Dimension Mind Pulsar: Self-existing Moon Four; Galactic Moon Eight; Crystal Moon Twelve. Identify and fulfill form (of purpose, challenge, and service). 1. Magnetic Time Overtone Pulsar: Magnetic Moon One; Rhythmic Moon Six; Spectral Moon Eleven (unifies fourth first and third dimensions). 2. Lunar Life Overtone Pulsar: Lunar Moon Two; Resonant Moon Seven; Crystal Moon Twelve (unifies first, second and third dimensions). 3. Electric Sense Overtone Pulsar: Electric Moon Three; Galactic Moon Eight; Cosmic Moon Thirteen (unifies second, third, and fourth dimensions). 4. Mind-Time Overtone Pulsar: Self-Existing Moon Four; Solar Moon Nine (unifies third and fourth dimensions). 5. Time-Life Overtone Pulsar: Overtone Moon Five; Planetary Moon ten (unifies fourth and first dimensions). By learning the interlocking annual rhythms and patterns of action, collective planetary goals can be mapped and realized. By synchronizing behavior with the pulsars and overtone pulsars of the planetary service wavespell new and unexpected powers can be literally unearthed on behalf of the Earth and all that lives. There are 13, 28-day moons to one solar-lunar year, or 364 days. There are 28, 13-day wavespells to one solar-lunar year, or 364 kin. There are 52, 7-day weeks to one solar-lunar year, or 364 days. Green day [Day-Out-Of-Time], galactic freedom day, (July 25), a day not counted on the 7-day week, is the 365th day. There are 365 days to one solar-lunar year. There are 52 years to one galactic-solar cycle, or 18,980 days. There are 73 galactic spins to one galactic solar cycle, or 18,980 kin. There are 13 accumulated days every 52 years (now counted as extra days every four years), which creates a galactic jubilee wavespell, like green day, celebrated outside of the calendar every 52 years. Green day is the plus one factor. The plus one factor allows the fourth-dimensional sprocket of time to slip into a new chromatic every 365 days. Through chromatic shifts, g-force (interdimensional ‘fluid’) continues to circulate unimpeded through the 13-moon wavespell body of Earth-in-time. The wavespell body of Earth-in-time is a fourth-dimensional event. By adopting the 13- moon wavespell calendar, humanity also becomes a fourth-dimensional event, a moving wavespell. It is by operating as thirteen moons in motion that the human organism becomes a unified collective being. Acting as a 13-moon wavespell in motion, humanity generates g-force on its behalf. Without g-force, human life entropizes, becomes stale and past-bound. With g-force, life syntropizes, releases into the now, and aggregates telepathically. The time to pass from third-dimensional entropic materialism to fourth-dimensional syntropic telepathy is the eight solar-lunar years, AD 1992-2000. By following the 13-moon wavespell calendar during this eight-year cycle humanity can successfully cross over the harmonic threshold of galactic culture. Galactic culture is based on living in time, which is the fourth-dimension. 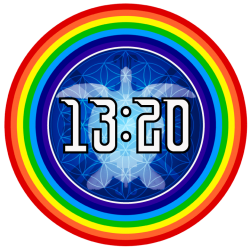 The purpose of presenting the 13-moon wavespell as a two-year calendar is to offer enough ‘starter time’ for the new galactic culture to take. The critical eight-year phase of the 13-moon wavespell, the path of enlightenment for all humanity, began with the Blue Cosmic Storm year, July 26, 1992 – July 25, 1993. During this year the Interplanetary Council was called into action. This is the fourth- dimensional body of solar intelligence. By the 27th day of the Galactic Moon of the Blue Cosmic Storm Year (March 5, 1993), a new galactic spin commenced. This was the 9th 260-kin spin since the Harmonic Convergence, August 16-17, 1987, which opened the gates of galactic culture to humanity. By Galactic Moon, Day 27, Magnetic Dragon on the galactic spin, the Earth Tribunal of the Interplanetary Council delivered its 13-moon decrees and commands for all the life of planet Earth. With these ultimatums, the wither ghost of the old order is collapsing. Through this 9th galactic spin, ‘Thirteen Moons in Motion,’ the 13-moon calendar is to be dispersed throughout the planet. The grand climax and proclamation of this process will occur on the start of the second year of the eight-year 13-moon conversion cycle: Yellow Magnetic Seed AD 1993-94. By the next Magnetic Dragon Day, Day 6 Overtone Moon, (November 20, 1993), the 10th galactic spin commences. This spin is called ‘Earth Detox,’ and runs through the remainder of the Yellow Magnetic Seed year. During this time, humanity as planetary kin will be following the path of the thirteen moons. The planetary service wavespell will be fully in motion. The conversion of swords into plowshares will be underway. The interdimensional technologies needed to detoxify the Earth will be forthcoming. The value of humanity united on behalf of cleaning up the Earth and transforming the material remnants of third-dimensional civilization is inestimable. In return is the full blessing of entering galactic culture. When you being to follow the path of the thirteen moons, you are entering a stream already in motion. This is the stream of galactic, fourth-dimensional reality. Once you enter you will see, you cannot enter the same stream twice. There is only learning. Among the thirteen moons of the Yellow Magnetic Seed year, find your birthday. Note the Moon day number, the name of the day of the week, and the wavespell and its kin number. Then find your birthday among the thirteen moons of the next year. Note that your birthday is always on the same day of the week in the same Moon, but that the wavespell and kin number changes. Also note that the correspondence between the moon day numbers and days of the week remains constant for any moon, e.g., the 13th day of any moon is always Friday the 13th. In this way, you can own and celebrate one of the 28 days as your own, moon after moon! Each moon has four weeks of seven days each, each week running from Sunday through Saturday. Green day is outside of the Moons and the days of the week. The moon of 28 days is the mean or average moon of the human female menstruation cycle. The actual lunation cycle is 29.20 days. Every eight years there are precisely 100 lunations of 29.20 days and 104 moons of 28 days each. This eight year cycle is called a lunar octave. On the 13-moon calendar, a blank circle indicates a new moon and a white circle the full moon. Other key holidays, as well as solstices and equinoxes are noted in their appropriate places. Gregorian calendar equivalences are noted in the lower left corner of each of the 28 days of each moon. The 13-day wavespells form a four-color sequence overlay on the 28-day pattern of the 13-moons. By studying the patterns, you can learn that 19 moons is the minimum cycle for the repetition of one pattern, e.g. Magnetic Moon One, Blue Cosmic Storm Year and Resonant Moon Seven, Yellow Magnetic Seed Year each encompass two complete wavespells, with the first and 28th days being the last and first days, respectively, of two other wavespells. But even here the colors of the wavespells differ. How many moons will it take before there is a return to the exact same wavespell pattern inclusive of color? Note that for each thirteen-day wavespell, the first, fifth, ninth and thirteenth positions are highlighted. As in the 13-moon wavespell, these four positions mark the two gates and two towers of the thirteen day wavespell. In this way you can learn that the pulsar codes apply equally to the thirteen day wavespells as well as to the wavespell of the thirteen moons. This is something of what is meant by the holon simultaneities of fourth- dimensional time. The 13 kin (day) positions of each wavespell are numbered in galactic notation from 1-13. The thirteen day wavespell is a function of the 260-kin galactic spin. There are 20 wavespells to one galactic spin. The color coding of the wavespells is unvarying: red- white-blue-yellow. This means that there are five sets of four wavespells each. Each of these sets is called a castle. As the 260-kin galactic enzyme code, there is an interlocking sequence of 20 solar seals and 13 galactic tones. These are arranged in 13 vertical columns of 20 units each. The names and icons of the seals are listed on the left hand side of the galactic enzyme code. Each of the vertical columns of the 260-kin galactic enzyme code is called a harmonic run of 20 positions, there are five sequences of red- white-blue-yellow. Each of these sequences is called a time cell. The numbers 1-13 in galactic notation are repeated in succession beginning the upper left hand corner, and always proceeding from the bottom of one harmonic run to the top of the next. Wherever ‘1’ appears in galactic notation that marks the beginning of a wavespell. Within the galactic enzyme code is a pattern of 52 kin which is called the Loom of the 13 Moons. Each of these 52 kin is called a “galactic activation portal.” These are special days for tuning into the activation of the enlightenment body of Earth-in-time. On the calendar of the 13 moons these galactic activation days are indicated by a hexagon in the lower right hand corner. A diamond indicates one of the polar kin which regulate one of the four 65-day galactic spectra or seasons of the galactic spin. At the bottom of each page your Moon calendar is a brief summary of which castle, which wavespell, which harmonic runs, and which kin numbers are encompassed by that Moon. By following the path of the 13 moons you are learning anew. You are now fully entered into the stream of galactic culture. If you wish to learn more about the galactic codes, then proceed directly to Dreamspell: The Journey of Timeship Earth 2013.